A new archaeological excavation of an Israelite fort located on the border of Judea and Philistia brings new light to the controversy over the Davidic Empire. The name of the site is Khirbet Qeiyafa and it is being excavated by Yosef Garfinkel of Hebrew University with the assistance of Saar Ganor also of Hebrew University. The site is located overlooking the Elah Valley where the Hebrew Bible places the story of David and Goliath. Garfinkel identifies the site as Biblical Shaarayim (1 Samuel 17:52). Shaarayim means gates in Hebrew and this is the only site of the area and period in which two city gates have been found. This site is somewhat a unique tell in that all of the pottery shreds found are from the same period, Iron Age IIA. This makes the site especially relevant to the debate over the existence of Davidic Empire as this is the period which the Bible places David and Solomon. Although the pottery gives us the period of Iron Age IIA, it does not necessarily fix the date to 1,000 B.C. as there is continued debate as to when this archaeological period began. The traditional dating of this period begins the period in 1,000 B.C. while the minimalist begins the period about 50 years later. Fortunately this problem has been solved by the carbon 14 dating of ancient olive pits found on the site. 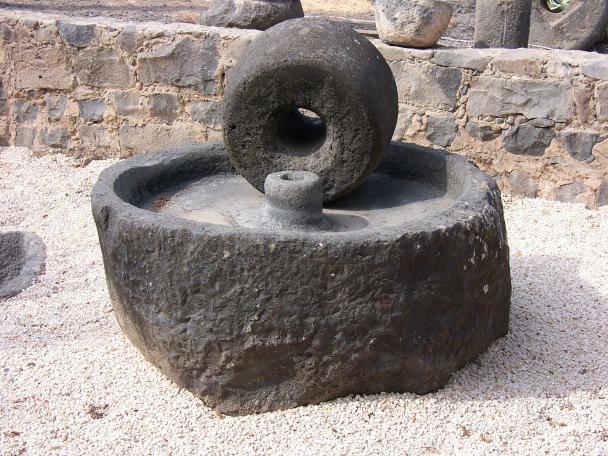 The carbon 14 dating gives a range for the date of the olive pits at 1,100 to 920 B.C. at the 94% confidence level and 1,050 -970 B.C. at the 50% confidence level. Based on this information the archaeologist has dated the founding of Khirbet Qeiyafa at no later than 1,000 B.C. This information leaves little question that this site was built during the time period which the Hebrew Bible places the empire of King David. Two additional discoveries at this site give us additional insight into the sophistication of the Davidic Empire. First, this fort was enclosed by a casement fortification wall 700 meters long and 4 meters thick which also contains two four chamber city gates. Some of the ashlars in this fortification weigh up to 5 tons with the total fortification requiring 200,000 tons of stones. In order to build a fortification of this magnitude, it would require a much more organized and complex society than a Tribal Chiefdom. Second, the most fascinating find at this site is a 6 in. X 6 in. ostracon, which contains five lines of proto-Canaanite letters. This lettering was used by ancient Canaanites, Hebrews and Phoenicians. This ostracon is securely dated to the 10th century B.C. based on the context where it was found and is the oldest Hebrew inscription found to date. This ostracon refutes the minimalist position that the Israelite population was not literate during the time of David and Solomon. In archaeology we rarely make a discovery which proves a hypothesis without further archaeological evidence. Archaeology is a science which relies on cumulative evidence gathered over time and possibly several different sites. In the debate over the Davidic Empire archaeologists are beginning to accumulate substantial evidence which refutes the minimalist position of the Davidic Empire (that it was a small Chiefdom if it existed at all). The House of David inscription discovered at Tell Dan, the work being done by Eilat Mazar in the Ophel in Jerusalem , and this evidence at Khirbet Qeiyafa all go together to provide the cumulative archaeological evidence to support the hypothesis that the Davidic Empire was substantially as represented in the Hebrew Bible.